One of the problems I have been working on is a way of thinking about people models. I have had two stimuli. First my son worked for Mark Warner (the holiday company) one summer and I was amazed to learn that he was paid almost nothing (€50 per week) and that his minimum wage was made up with the cost of his accommodation and benefits, such as use of facilities. Yet there were three people applying for every job and he loved his experience working with Mark Warner: he also did a winter season with them. This seemed to me to be an interesting people model. My second stimulus was that operating model work is about making choices. So I began to lay out the choices that are made for different people models. 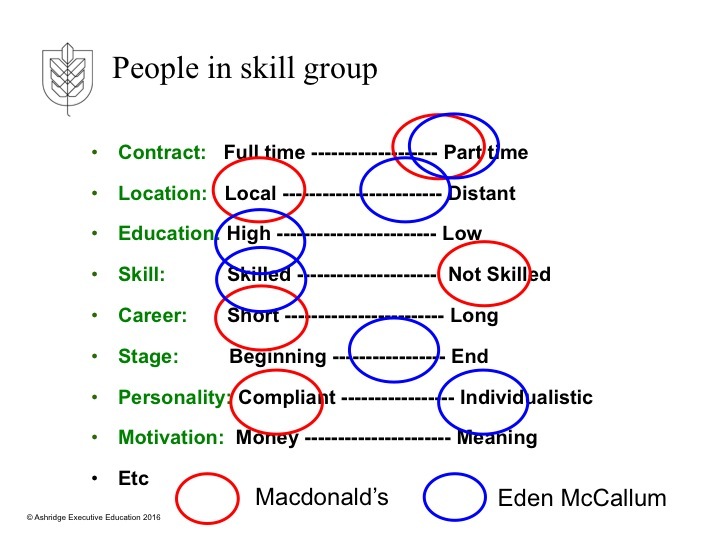 Choices about the sort of people to be hire – skilled or unskilled, motivated by money or by meaning, etc. Also choices about the offer to these people – full time or part time work, above average or below average pay, etc. This thinking evolved into a four column format for laying out a people model. I have since thought that maybe it should be a two column model. But here is the four column version. Lets start with the first column: the type of people that you want to hire into the skill group. Each item involves making a choice. “Contract” is about the type of contract that these people want. “Location” is about where the people live. The next exhibit shows the choices made by McDonald’s for staff in restaurants and Eden McCallum for consultants. There are different ways of laying out these choices. The above is a crude Powerpoint with a misspelling of McDonald’s! 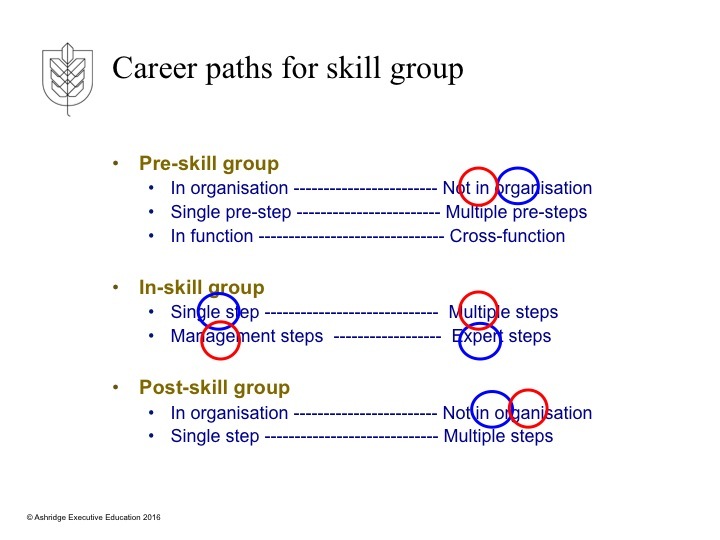 But the next visual shows a more attractive display of a skill group with three roles in it. A similar analysis and series of choices can be made for the “value proposition” to the people you have decided you would like to attract. The last column on “culture” is more difficult to boil down into a few choice areas. This of course is also true of the first three columns. There are many choices that are not represented. But the cultural values column is particularly difficult to illustrate in terms of simple choices. 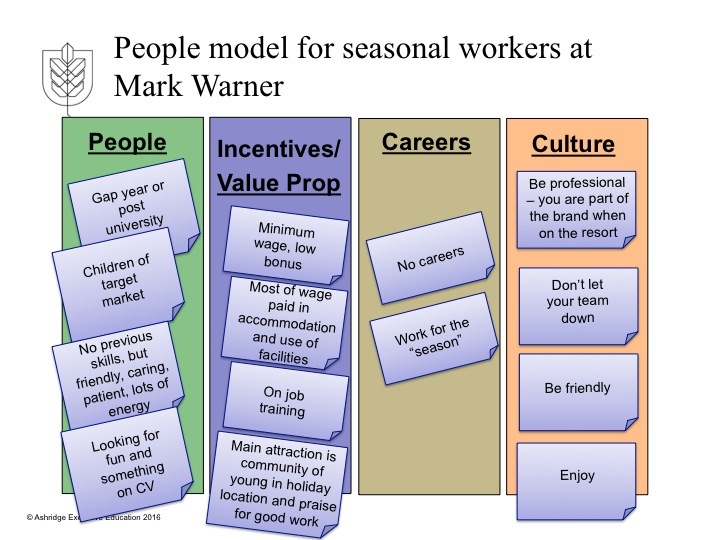 So instead, I attach my summary of the people model for Mark Warner (my views not an official Mark Warner document!). In developing this tool, I also realised that it makes little sense to create a people model for a company. 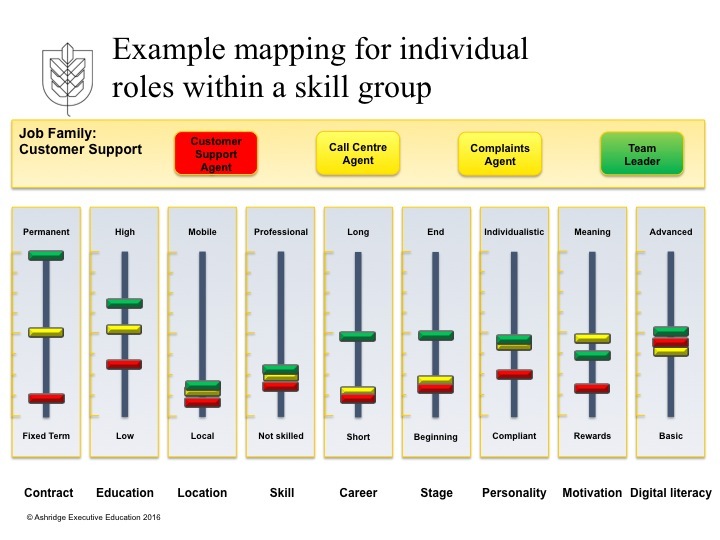 People models need to be created for important skill groups within a company. yes a company may have an overall employer brand. But it will not have only one people model. This entry was posted in People model. Bookmark the permalink. Thanks Richard. Lots of good thoughts here. Yes the Business Value Proposition is the starting point for a people model – what is it that these people are going to be doing – this drives the judgments about what sort of people you want and other elements. Your point about HR practices and policies is an interesting one. Of course this could also extend to management practices in terms of the type of leadership that the identified group of people should expect to get. Let me think about this. It could be a fifth column. Apologies for the delayed response, hopefully the post is still a live discussion. 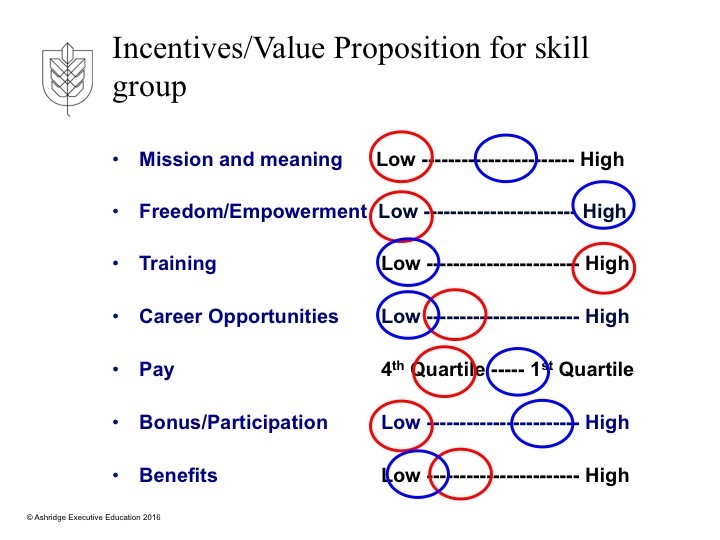 This feels very much like setting out the Employee Value Proposition(s) for the key talent (i.e. job families) that are organised within the Operating Model. I wonder if an EVP model would be instructive for your People Model, I have a picture that I’ll email directly as I’m not sure I can post images on the blog. I agree with Richard that understanding and articulating the converse, Business Value Proposition, i.e. what is the ‘return’ expected for the ‘investment’ made in key talent through the EVP and how this enables the Operating Model is a very valuable line of questioning.